On Friday November 14 The Wall Street Journal printed a feature article about Chassidic rabbi and comedian Mendy Pellin on its front page. We have been featuring Mendy's schtick on Jewish Humor Central since 2010, with 12 posts including his music parodies, news show parodies, and other funny stuff. Mr. Pellin is an Hasidic Jew who trolls Tinsel Town in a skull cap and sneakers, a long beard grazing his polo shirt. An ordained rabbi, his risky mission is to show the world that an observant culture—largely absent from the comedy mainstream—is natural fodder for funny. “I call this period the ‘Hasidic Spring,’ ” he says, noting that many Hasidic youth are now embracing Facebook and Twitter, thereby pushing the boundaries of a once-insular society. 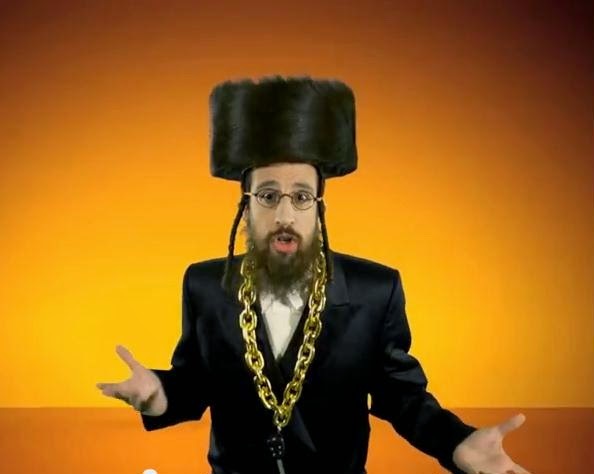 “Talk Yiddish to Me” is one of Mr. Pellin’s signature online music videos. A parody of the hit Jason Derulo song, “Talk Dirty,” the number features the comedian, dressed in full black Hasidim garb accented with an enormous gold chain. Surrounded by singing sidekicks, he sways back and forth, as if praying, and busts the kind of rap moves—like hand gestures straight from the ’hood—more often associated with 50 Cent or Eminem. YouTube counts more than 237,000 views for the video; Mr. Pellin says it has received millions more hits via other social networks. What do other Hasidic rabbis think of Mendy's schtick? Those with a sense of humor generally like it and those without a sense of humor don't. The article has lots more information about Mendy and other Orthodox comedians. It's a good read and worth your time. You'll find it right here.